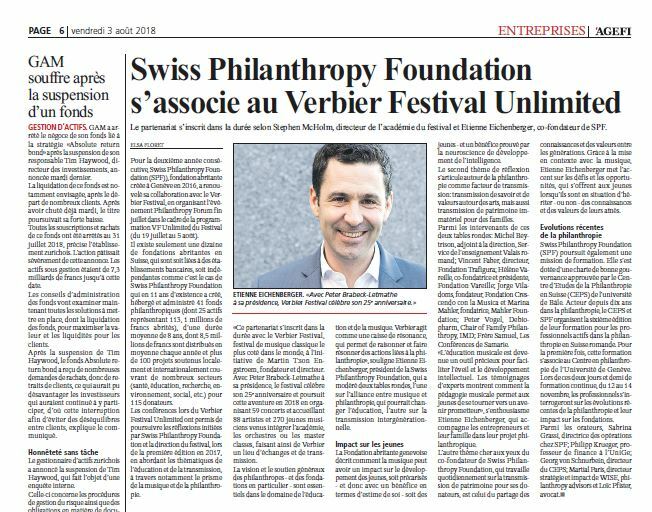 For the second year in a row, the Verbier Festival Foundation and Swiss Philanthropy Foundation have teamed up to develop annual meetings together as part of the Verbier Classical Music Festival. Through interactive formats that promote exchanges, workshops and roundtables will address the issues and challenges of today’s and tomorrow’s philanthropy with a focus on music. Saturday 20 July 2019 | 14h00 – 15h30 : Should more be done for Culture in the 21st Century ? Sunday 21 July 2019 | 14h00 – 15h30 : Are We Generous ?